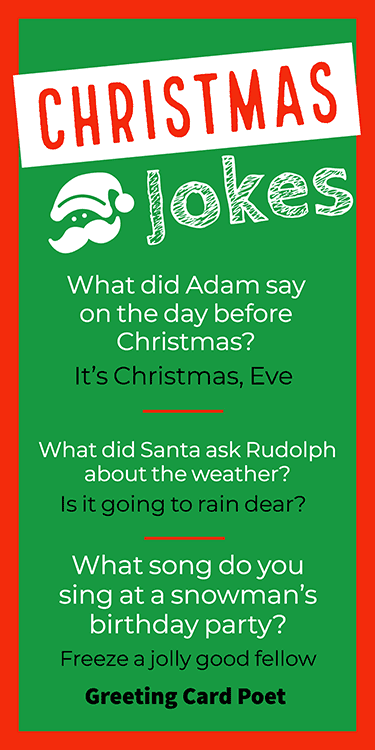 This is one awesome collection of Christmas jokes! ‘Tis the season of joy, and there’s no more joyful sound than that of laughter. These are sure to get everyone into the holiday spirit and call be enjoyed all the way through the Holidays. In our collection, you’ll find lots of family-friendly humor about Christmas, Santa, elves, reindeer, and so much more to keep your family and friends ho-ho-ho-ing throughout the holidays. What else more do we have in store? Corny Xmas jokes? Oh yea, we have those too! Have fun bring in the good cheer of the season with this collection. Why is a broken drum the best Xmas gift ever? Which of Santa’s reindeers have to mind their manners most? Why don’t reindeer like picnics? Because of all their ant-lures. Frosty the snowman with a hot flush. What happened to the turkey at Christmas? When is a boat just like snow? I couldn’t hear them, so I have snow-idea. Why is winter a snowman’s favorite time of year? It is when a snowman can camouflage. Children: This turkey tastes like an old sofa. Mom: Well, you asked for something with plenty of stuffing. What is a skunk’s favorite Christmas song? Why does Scrooge love reindeer? Because every single buck is deer to him. What’s the difference between a North Pole alphabet and a regular alphabet? The North Pole alphabet has No-el! What is Mom’s favorite Christmas carol? Where do the elves keep their earnings? Why does Santa enter houses through the chimneys? What do you call a frog hanging from the ceiling? What do you get when you cross Santa with a duck? 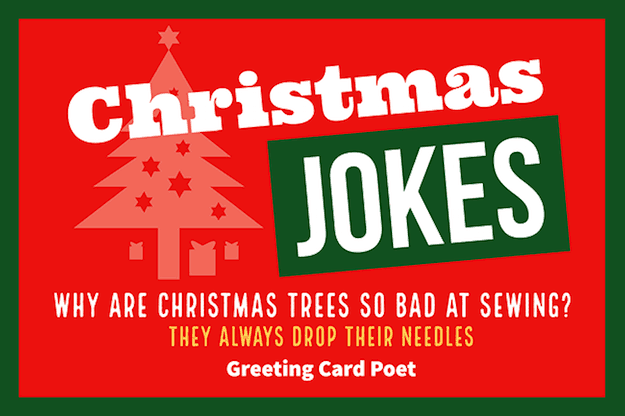 Tip: These jokes and puns are great for your family Christmas card. How do you know that a snowman is not in a good mood? When he gives you the cold shoulder. How does Xmas Day end? What do angry mice send to each other during the holiday season? What are the best Christmas sweaters made from? Why was the snowman rummaging in the bag of carrots? Where would you find chili beans? What do sheep say at Xmas? Wool-tide Bleatings or A Merry Christmas to Ewe. Where does santa keep all his money? At the local snow bank. What do you call Santa when he takes a break? Is it going to rain dear? What did Santa say to the smoker? Please don’t smoke, it’s bad for my elf. Where does Santa go when he’s sick? What does Rudolph the red-nosed reindeer eat for breakfast? Where does Rudolph the red-nosed reindeer express his deepest, secret thoughts? Why is Rudolph the red-nosed reindeer so cold at Christmas? What did Rudolph say when he stepped into a big puddle? What does Rudolph the red-nosed reindeer like about rainy days? He looks at the calen-deer. Who’s the smartest member of Santa’s sleigh team? Why didn’t Rudolph make honor roll in school this marking period? What do you call a broke Santa? What did the one snowman say to the other? What is the difference between a Santa and a knight? One slays the dragon, and the other drags the sleigh. What did Adam say the day before Xmas? Why are Xmas trees bad at sewing? How much did Santa Claus pay for his sleigh? Nothing. It was on the house. Why did the elves rob the liquor store? They needed some holiday spirit. What did the North Pole weatherman say to his wife? What happened to the thief who stole the advent calendar? He wanted to sleep like a log. Why wouldn’t Santa ride his sleigh? For elf and safety concerns. What cars do elfs drive? Because every buck is deer to him. What did the cow say on Xmas morning? What do you call an elf who steals gift wrap from the rich and gives it to the poor? The North Pole doesn’t import goods because it’s Elf Sufficient. Where do mistletoe go to become famous? What does the Grinch do with a baseball bat? Hits a gnome and runs. The Christmas alphabet has No-el. Because of all the wrapping. What do you call a reindeer who can write with both his left and his right hooves? What’s a female elf called? What do snowmen like to do at the weekend? What was the elf’s favorite sport? What kind of money did the elf on the shelf use? Who lives at the North Pole, builds toys and rides in a pumpkin? What do you call a rich elf? What did Santa say to the elf who said he made the worst toys? Why was the elf so quick to anger? He had a short fuse. Who is the Music Elf’s favorite reindeer? Why did Santa’s helper visit the doctor?